Beth Shulman’s powerfully argued book offers a full program to address the injustice faced by the 30 million Americans who work full time but do not make a living wage. 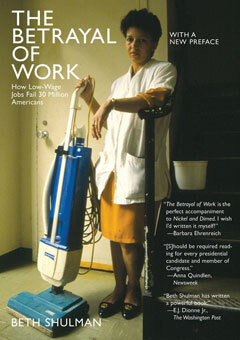 As the influential Harvard Business School newsletter put it, Shulman “specifically outlines how structural changes in the economy may be achieved, thus expanding opportunities for all Americans.” This edition includes a new afterword that intervenes in the post-election debate by arguing that low-wage work is an urgent moral issue of our time. On April 30, the National Employment Law Project (NELP) will honor economist and writer Nancy Folbre, U.S.